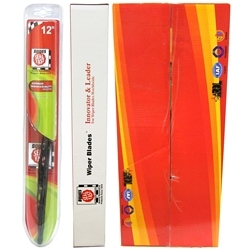 All Seasons 12" Wiper Blade Bowes WB 28112 Case of 10. With a durable steel galvanized frame. High quality natural molded rubber with graphite coating providing the best streak and chatter free performance. Stainless steel for quiet operation and even pressure. Built in air damper which prevents lift at highway speeds.